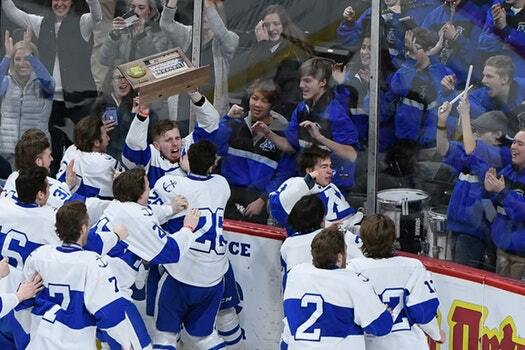 Bad bounces and missed opportunities of Minnetonka’s hockey past disappeared from memory Saturday as the Skippers joined the pantheon of state champions. Five failed tournament runs, from a title game loss in 2010 to a third-place finish in 1990, kept them on the cusp of greatness. But they charted a championship course under first-year head coach Sean Goldsworthy, a school alumnus and captain of that third-place team. Matching the Greyhounds’ hustle and physical play all night, top-ranked Minnetonka bore down and created opportunities at every turn in a 5-2 victory. An announced crowd of 18,914 watched at the Xcel Energy Center in St. Paul as the Skippers shed their hard-luck past for an ultimate triumph. That wasn’t the situation in January, when Duluth East won 4-2 at Minnetonka (27-2-2). The setback served first as a good lesson and later as motivation for a rematch. Molenaar completed the most pivotal sequence. Trailing 3-2 to begin the third period, Duluth East couldn’t convert with 1:27 remaining on its power play. Then Molenaar deflected the puck into the net with his left skate, triggering a video review. Officials upheld the goal and Minnetonka led 4-2. “When that one went in, you kind of question whether it’s going to be your night or not,” Duluth East coach Mike Randolph said. Randolph, hoping to lead No. 3 seed Duluth East (25-3-3) to its first state championship since 1998, had reason to doubt early on. His team leading 1-0, Greyhounds forward Ryder Donovan nearly scored shorthanded. But goalie Charlie Glockner made two acrobatic leg pad saves. Moments later, hiccup-quick sophomore Bobby Brink tied the game on the power play. 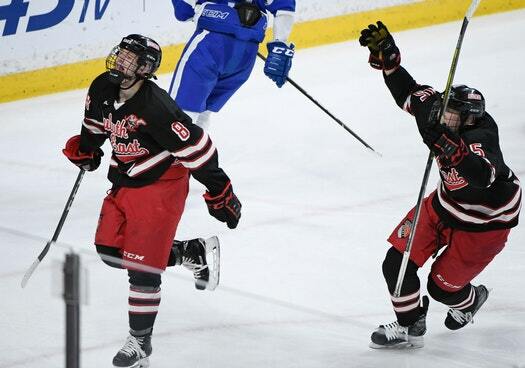 Duluth East went a crippling 0-for-6 on the power play while Minnetonka scored twice on three chances. Minnetonka, considered an elite puck-handling and passing team, clinched its victory with one more skill-meets-luck sequence. Defenseman Grant Docter, behind his the goal line, turned and fired the puck toward Matt Koethe near the red line. Koethe gloved the puck, tossed it to the ice and fired into the open Greyhounds' goal. Releasing the past from its grip, Minnetonka could grab its first championship with both hands. He took a beating as a parade of Greyhounds crashed the net with vigor but seemed only to get better as the physical play ramped up. A sprawling left-leg stop of Duluth East’s Ryder Donovan was the signature save among Glockner’s 29. For good measure, he added an assist on Matt Koethe’s empty net goal. The Skippers’ top goal scorer was the beneficiary of a favorable bounce in the third period, when Grant Docter’s point shot caromed off his skate and into the net. The lone goal of the third period was Molenaar’s 31st of the season and put Minnetonka ahead 4-2. He also had two assists. The forward known more for his solid two-way play than big-game offensive production assisted on Ricky Lyle’s first-period goal then scored one of his own in the second. Minnetonka made program history, taking home its first Class 2A state boys’ hockey tournament title with a 5-2 victory against Duluth East. The top-seed Skippers (27-2-2) chartered a championship course under first-year head coach Sean Goldsworthy, a 1990 graduate who took third in the tournament as a senior. An announced crowd of 18,914 watched Saturday at the Xcel Energy Center in St. Paul as four different Minnetonka players scored. The Skippers weathered the Greyhounds' hustle and physical play. Trailing 3-2 to begin the third period, Duluth East couldn’t convert with 1:28 remaining on its power play. Then Minnetonka bumped its lead to 4-2 on Joe Molenaar’s goal. He deflected the puck off his left skate, which put the play under video review. Officials upheld the goal at 2:27 of the period. The Greyhounds got no closer, catching the crossbar flush on one shot. 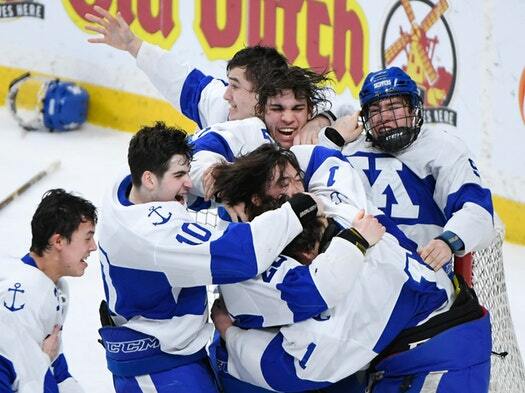 Minnetonka, considered a top passing team in high school hockey, clinched its victory on an incredible sequence. Defenseman Grant Docter, behind his team’s goal line, turned and fired the puck for senior forward Matt Koethe to catch near the red line. Koethke gloved the puck, then tossed it to the ice and fired into the open Greyhounds goal. Down 2-1 entering the second period, Duluth East made two goalie-punishing rushes that failed to get results. On the second such play, forward Ryder Donovan crashed over goalie Charlie Glockner like a red and black wave. Glockner finished with 29 saves. Minnetonka went on its second power play and defenseman Andrew Hicks blasted home his team’s second goal with the man advantage. That gave the Skippers a 3-1 lead. The Greyhounds’ Austin Jouppi charged the net once more, only this time for a goal to make it 3-2 at 6:28 of the second period. Duluth East took charge early in an exciting first period, only to see Minnetonka fight its way back in front. Ricky Lyle, who delivered tone-setting hits early the semifinals, made his presence felt on the score sheet. He buried a great second-effort pass from Jouppi for a 1-0 lead. The Greyhounds did not take a penalty against Edina but paid for putting Minnetonka on the power play. Hiccup-quick sophomore Bobby Brink drew the tripping penalty then administered the payback with a backhand shot and a goal at 12:06. But credit Glockner for keeping the Skippers from a 2-0 hole. He stopped golden shorthanded chances by Duluth East’s Donovan. Just 98 seconds after Brink’s goal, Koethe burst past his man, cut to the net and scored high over goalie Parker Kleive for a 2-1 advantage. No. 3 seed Duluth East (25-3-3) sought its first state title since 1998. Duluth East won 4-2 in the teams’ previous meeting on Jan. 6 at Minnetonka. But that was a different game. Greyhounds goaltender Parker Kleive had the night off. Luedtke was injured. Both played Saturday.